For those who watch Kofi Kingston in action for the WWE they know that his energy could power a major city for several years. The Ghanaian grappler with a beaming smile, Kingston’s boundless enthusiasm is rivaled only by his limitless athleticism, which he displays fearlessly every time he steps in the ring. Most of the people who don’t like Kofi Kingston are the Superstars he faces each week — and that’s only because they can rarely catch him. His dazzling aerials only belie what is truly a fierce fighter, who can curtail the smiles to kick it up in intensity if an opponent is foolish enough to set him off. Kofi has the Intercontinental Championships, United States Championships and WWE Tag Team Titles including The New Day setting the record for the longest Tag Team Championship reign in WWE history. What lies ahead remains to be seen, but it’s unlikely to stop Kingston from shining brighter and brighter probably because he actually keeps leaping closer and closer to the sun. Kofi and some of this WWE colleagues will be featured in an all new animated film called Scooby-Doo and WWE: Curse of the Speed Demon. When Scooby and the gang attend an off-road racing competition, the last thing they expect is to stumble upon a menacing phantom. However, before they can say “ruh-roh,” things take a turn for the worse, as Inferno schemes to sabotage the race and cause chaos for everyone. With the help of WWE Superstars Triple H, Paige and Sheamus, as well as Scooby’s new driving partner, The Undertaker, it’s up to Scooby-Doo and the Mystery Inc. gang to save the race before it’s too late! I had a chance to sit down with Kofi to talk about the film, fatherhood and how he can’t wait to watch the Scooby-Doo film with his oldest son. Art Eddy: Let’s first talk about the latest animated film that you are in called Scooby Doo! & WWE: Curse of the Speed Demon. It was great. It had that classic Scooby Doo vibe to it mixed with the excitement of the WWE. You have a cool role in the film. What was your first few thoughts when you first read the script? 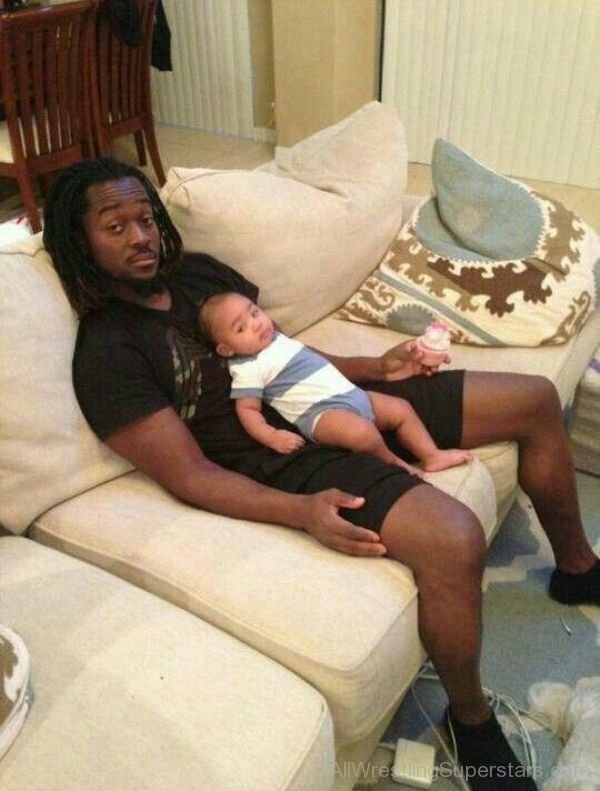 Kofi Kingston: I had no idea what to expect. When we first got the script it was just my lines. I didn’t know the context of the story. I just went in to record basically lines that were on the paper without really not knowing anything about it. It was very different than being in a WWE role. I got to be that color commentating guy. It was cool. It was just different. I really had a good time doing it. AE: You are working with your colleagues from the WWE as well as some very seasoned voice actors like Frank Welker and Steve Blum. Did you ask to get any advice from those voice actors? KK: No, everything was all separate. The first time around they just had me read the lines. About a year later I had to go to a recording studio and fine tune what was going on. I had to sync my voice to the actual cartoon. That was the first time I got see what I actually looked like on screen. I had the blazer on with a tie. I am on a hover board. It was cool to be doing that. I was never in the studio with anyone else. It is crazy to think that they could put an entire movie of taking people lines and when you see the actual movie it is completely seamless. Kudos to all of those people who put all the work into it. It came out as a great movie. AE: Do your kids know that you are in an animated movie and if so what do they think about you being in a movie? KK: They haven’t watched it yet. My youngest son is three months old so he is a little bit young. My oldest just turned three. I am trying to get my wife to allow us to all watch it as a family. We don’t really have him watch too much TV. I think this is one that we are going to have to make an exception on. He doesn’t really know who Scooby Doo is, but I have told him a little bit about him. Like I said he really doesn’t watch that much TV or movies at all. Everything he knows he knows through me. So like Darth Vader. I explained to him about the Force and Stormtroopers. Also Ninja Turtles and all the stuff that I think is cool I try to push on him. He knows all of that stuff through my word of mouth. We will have to make an exception and watch this Scooby Doo movie together because it is awesome. AE: You have accomplished a lot in your career in the WWE so far. You have been the Intercontinental Champion; World Tag Team Champion; United States Champion; WWE Tag Team Champion. Does one of those accolades rank higher than the others? KK: It is hard to rank them. I have been so fortunate to have so many cool moments. When they happen they feel really good, but I don’t know in comparison to each other on how good they are. When I won the Intercontinental Championship against Chris Jerhico it was amazing because that was the first title that I ever won. That was three months into my official career as a WWE Superstar. I looked up to Chris Jericho and I watched him when I was growing up. Shawn Michaels was involved in the match. That was amazing because he was my guy. So that was a pretty cool moment. I have had a lot of Royal Rumble moments. I pride myself on finding unique ways not getting eliminated. So that is pretty cool. The moment with Randy Orten in Madison Square Garden was a pretty cool experience. The New Day now has been amazing. We are all on the same page. Our chemistry is very real. We look at each other as brothers. You have people buying New Day shirts, buying unicorn horns. We pride ourselves on being able to do what we said we were going to do. At Wrestlemania we sold the most merch. We had the best-selling shirts. More than John Cena. More than Randy Orton. More than Brock Lessnar. It was us. They all have been very cool moments. I think I have been fortunate to have experienced a lot of cool moments with the WWE. KK: When we found out we were pregnant with our first she had to meditate. My wife wasn’t ready 100 percent for it. I was laid back about it. I was happy. It changes your life. It is a very stereotypical thing to say. People were saying that our lives were going to change. To actually experience it was amazing. It is wild to me. To still think that these people came from me. It is crazy as human beings we able to create these precious creatures. Children look up to us. They emulate everything that we do. They become real people. My son thinks he is an adult. I will say to him that he can’t do something, but he will say he can because he is an adult. It is cool to watch. You have a sense of pride just to be a father and a parent. To have somebody depend on you so much and be able to deliver is awesome. It is the best. KK: To stay true to themselves. There were a lot of times when I was growing up that I wanted to either fit in or be like somebody else. Kofi is a very unique name. When I was going to school I would get made fun of. I would be called coffee or other types of names. I was mad at my parents because they didn’t name me Joey. I wanted to be called Joey. I was crying. I was asking why they named me Kofi. Honestly now I take pride in my unique name. I started becoming true to myself. I want to instill that in them at a young age. My oldest, he is three right now, has such a strong personality that he gets from his mom. He definitely knows what he wants. I don’t think he is going to have any difficulty in doing his own thing. He does his own thing now. He marches to the beat of his drum. It is all good. KK: Exercise patience. Like I told you my oldest is very strong willed. I am still working on it. You definitely have to be patient and allow kids to be kids. I find myself having to tell him certain things about five, six, seven times before he actually listens. Kids being kids. It can be frustrating at times. I am still working on that myself. You got to be patient with them. You will look back at these days and it will make for really funny stories. The other day my wife was wearing a hair tie on her head like a headband. He was crying. He was just so mad that she wouldn’t take it off because he didn’t like it there. The things that he gets mad and frustrated about is just hilarious. She took a picture and sent me the selfie. She is smiling and he is the background crying like his world is ending. He is just so mad that she is wearing that hair tie like a headband and not a hair tie. Little things like that. You just have to cherish these moments. It is a lot of fun. It is a lot of work. I am lucky to have a wife that is very, very good. She is Superwoman for sure. Women having babies is super-hero stuff. It is just incredible. They say happy wife, happy life. I try my best to keep her happy because she does so much and she is so great with these kids. KK: We are going to watch the Scooby Doo movie together, so that one will probably be our favorite. I took my oldest to see Alvin and The Chipmunks. He liked that one. So right now that is our favorite family movie. KK: All The Way Up by Fat Joe. KK: Right now we are in Ithaca, New York. My wife grew up here. It is the best up here. It is so laid back. Everyone is really nice and friendly, which is a nice change of pace from being up north. I feel like New York and sometimes people in Boston are mad because it is so cold. They get mad at the world. So being here in Ithaca is awesome. There is a lot of cool stuff to do. We just came from a kid’s farmer’s park. This is probably the best place for a family vacation. AE: I know you are a die-hard New England fan. Rank the New England sports team? KK: From least to greatest and it is tough to say that is Bruins, Red Sox, Celtics, and then the Patriots. AE: You are a sneakerhead just like me. What is your favorite pair of kicks that you own? KK: Oh boy. I own way, way, way too many. I had a pair of Nike Hyperfuse that had a tiger stripes on them. Those were pretty cool. I also love the Jeremy Scott’s. Anything with the wings on them. I wore a pair Jeremy Scott Wings 2.0. They had Jeremy Scott’s face, but it was money prints. I had those for Money in the Bank. I wanted to wear those for a long time. 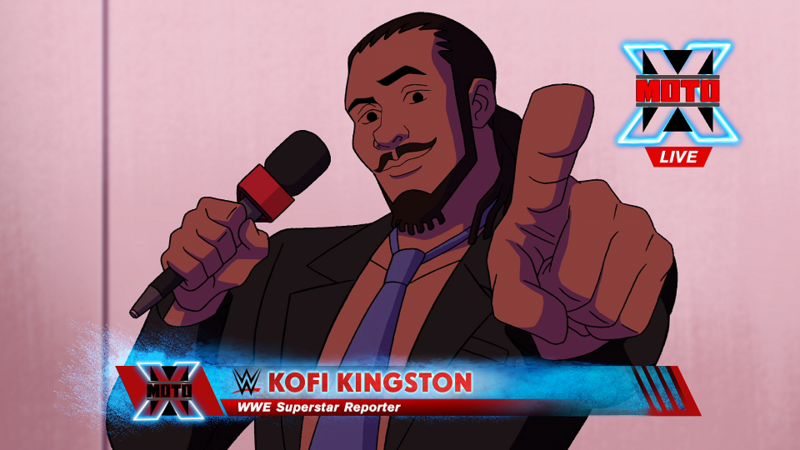 Follow Kofi at @TrueKofi on Twitter and make sure you pick up Scooby Doo! & WWE: Curse of the Speed Demon on Blu-ray & DVD.